Think you know what you eat? It is time to remove the blindfold from the foods you thought you knew and loved. ← Feed me, Seymour! Are you feeding cancer cells? Yabba Dabba Don’t! Why Flintstones vitamins are toxic! That’s right, these “vitamins” claim to be filling a nutritional void in our children, but in fact they are doing more harm than good. In fact – the product even has a “do not overdose” disclaimer on it – because in fact the artificial iron put in these vitamins could be TOXIC if taken in large quantities. Poison control huh? Just who I want to call when I think I’m aiding my child’s nutrition. Don’t believe it? Well Europe does! In fact, according to Natural News, many of the substances used in these vitamins are considered HAZARDOUS SUBSTANCES in Europe! How can this be? Well marketing has managed to make these cute cartoon friends seem safer, more delicious, and friendlier then anything out there. In fact I am sure if I asked, these vitamins are the first children’s vitamins to come to mind in both parents and kids. This marketing scam is surely doing one thing, convincing us to buy. The thing it is not doing is the reason we want the vitamins, to nourish and aid the development and growth of our children. What should we use instead? Parents looking for an alternative to commercial vitamins like Flintstones should check out whole food-based vitamin supplement brands like MegaFood, Garden of Life, and Pure Synergy. These brands use vitamins and nutrients derived from whole foods rather than laboratory concoctions, which means the body can assimilate them more effectively. 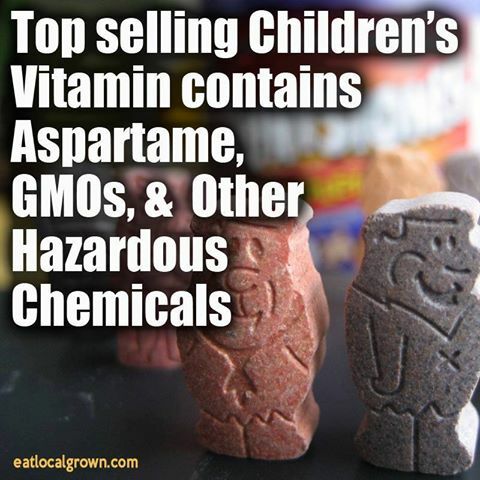 Protect your children and stay clear from these toxic cartoon chewables. "My goal is to unveil the truth behind the foods that we consume on a daily basis." Start young – 6 tricks to get kids to drink green juice!